Quezon City – Planning on a budget-friendly getaway this summer? Look no further. The City of Pines will mesmerize you with its timeless charm, in addition to its cool climate all year round. Baguio City is about 240 kilometers from the country’s capital of Manila, settled in the midst of lush mountains and foggy hills and gifted with significant cultural and historical interests. Its cold weather is suitable for everyone looking for a retreat or those who simply want to relax and have a breath of fresh air. Baguio City was named as the “Summer Capital of the Philippines” in 1903 and is the most visited haven in the northern part of the country. Located in the mountainous region of Cordillera, the city is a thriving space for indigenous peoples, who are divided linguistically into different groups. The fusion of modernization and colorful traditions of tribes from Abra, Apayao, Benguet, Ifugao, Kalinga, and the Mountain Province makes the city a fascinating attraction for tourists, especially those who enjoy cultural diversity. Through the years, a great deal of progress has been made in terms of enhancing the city, although many of its original attractions remain. Affordability and accessibility have also been big factors that make Baguio pleasant, since many of its tourist areas and open parks are walkable. In addition, the pedestrian-friendly sidewalks are conducive to a safe stroll. The restaurant scene is a booming one, with a wide variety of cuisines to choose from, whether local or international. Coffee and tea shops can also be found throughout the city. 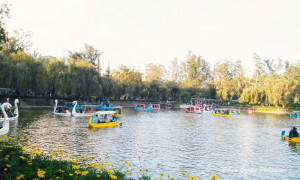 Some of the most captivating attractions in Baguio are Burnham Park that features a beautiful man-made lake, Camp John Hay that is situated in tall, lush mountains with a golf course designed by golf legend Jack Nicklaus, Mines View Park that overlooks the old Itogon mine, and The Mansion, a lavish two-story building that serves as the official residence of the Philippine President in Baguio. Just opposite the Mansion is Wright Park which will lead to one more stretch with plenty of ponies for rent. Best of all, entrance to these attractions are free. If you're in downtown Baguio and want to spend a few hours away from the typical tourist destinations, stop by the century-old building of Casa Vallejo. It is a charming, one-stop zone minus the hassle of a crowd. It houses a theater, bookshop, restaurant, spa, and a hotel. Movie lovers, especially those who adore long-forgotten Filipino classics or independent films, will revel in the Cinematheque located on the lower ground floor. It is an archival cinema inspired by Cinématheque Française that shows old flicks restored into digital formats. Bookworms will never run out of volumes to read in Mountain Cloud Bookshop that sells a wide range of Philippine literature and scholarly work. What is so extraordinary about this independent bookshop found in Casa Vallejo? Well, they have a special section dedicated to books about Northern Luzon, as well works of writers who have lived in Baguio. A restaurant just outside Mt. Cloud serves good food and delectable desserts. Hill Station, located at the ground floor of Casa Vallejo, offers savory dishes with a fine dining vibe. Affordable and delicious meals are almost everywhere in the city, but a tried and tested eating place that serves exquisite Filipino food is the Miner’s Cabin Café found just in front of Mines View Park Hotel. Diners will not only enjoy its yummy selections and huge food servings, but also its beautiful backdrop of tall pine trees and mountains. Food prices are reasonable and can be shared by two persons per serving. Their spicy bulalo is a must-try! A visit to the Baguio museum is a must for those who want to know more about the history and culture of the Cordillerans. It is a simple three-story gallery that contains artifacts of all the tribes in the region and also serves as a hub of cultural, educational, and cultural events in the city. A cool collection of accessories, hats, baskets, traditional attires, wood carvings, jars, and musical instruments are on display, giving visitors a glimpse into the way of life of the Cordillerans in the olden days in terms of clothing and livelihood. A colorful flower festival called Panagbenga (Blooming Flowers Festival) is celebrated yearly every February, which lasts up to a month. The celebration’s highlights are the parade of floral floats decorated with Baguio’s beautiful flowers and a street dancing parade where participants are dressed in colorful costumes. The word “panagbenga” comes from the Kankanaey word for “a season of blooming.” This annual festival was created in 1995 to bring back the city’s vigor after a 7.7 magnitude earthquake struck in 1990. Baguio is a quaint little town with a variety of places to choose from—museums, gallery cafés, parks. and gardens. It offers inexpensive activities ideal for family or friends who want to relax and enjoy without spending a lot. The city’s cool climate is the perfect alternative for the scorching heat of the sun during the summer months of March till May. The rich cultural heritage that inspires creativity and its lovely natural environment make Baguio a wonderful destination for everyone.